Our monthly issues got a makeover! Starting with our July 2016 issue, we completely updated the look of our All Access books. 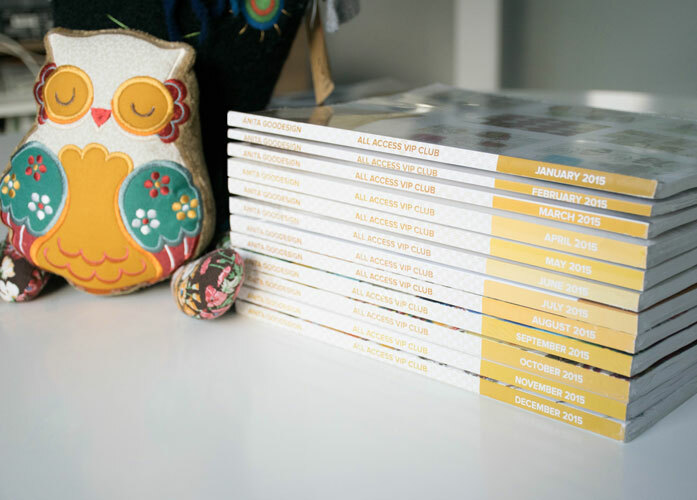 Now, instead of receiving two or more books every month we release a larger collection, those releases are included with your single perfect-bound book! So what exactly does a monthly issue look like? When you first open your beautiful, glossy new book, you’ll find our iconology to explain which techniques are used and an easy-to-understand table of contents. Next, you’ll find detailed descriptions of each of the collections included with your Club that month. Following this, you’ll get to hop straight in to our sneak peeks! Catch up with everything coming soon and see what we have in the works here on the Creative floor at Anita Goodesign. Our bonus content comes next. 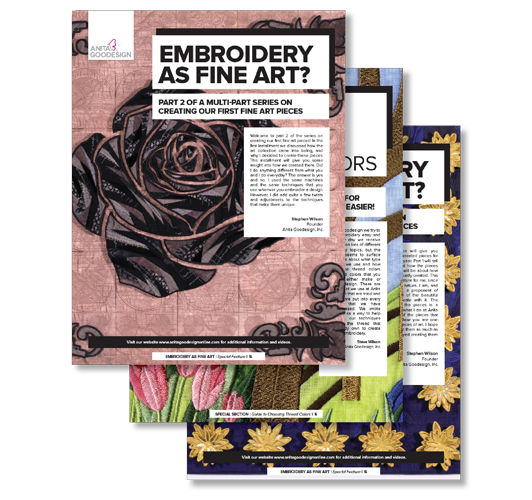 Here we add additional content for our All Access members to peruse, from detailed editorials about Embroidery as Fine Art to step-by-step tutorials for special techniques! This content changes monthly and is always educational! After our Design Guide and Stabilizer Guide, you’ll dive right in to your collections and tutorials! If a large release came out that month, such as a Premium Plus, it will be featured first. All Full, Minis, and Project Collections will follow. PLUS Every month, you will receive exclusives in a manner of different ways! With each issue, we show our All Access members exclusive glimpses at our upcoming collections and artwork that is still in production! Get the first look at what is happening on our Creative floor! We also include Bonus Collections with All Access! These collections have never been seen before and are released exclusively for our Club members to get the first look at designs that may be developed into larger releases in the future! You’ll even find bonus content each month for you to enjoy. This content comes straight from founder Steve Wilson himself or our hardworking Research and Development team and can range from informational editorial pieces to simple step-by-step instructions for exciting new techniques! With the launch of our new Website, we will be adding exclusive downloadable designs only accessible by our Club members! These limited edition, exclusive designs that no one else will have will be literally at your fingertips! Just download and start stitching!